Animal Health Foundation: Laminitis Research : AHF's Laminitis Q+A: What's the Key to Using a Grazing Muzzle on a Horse on Pasture? AHF's Laminitis Q+A: What's the Key to Using a Grazing Muzzle on a Horse on Pasture? Q. I promised my vet I’d be more consistent about using a grazing muzzle on my horse this spring when the grass turns green. I’m not sure I did it right last year. Can you give me some advice? A. (AHF) Grazing muzzles are effective in reducing the horse’s ability to eat grass. The problem is that there seems to be a variety of reactions to wearing one. Most horses and ponies fight them at first. I assume this is because of frustration at trying to eat. I tell clients to teach them how to eat on a mown lawn so they learn how to push grass through the hole. Then again, one client described how her pony got help from his two buddies, who both pulling at once on the muzzle. So far, three-horse power has won the fight of the muzzle. Other horses, once accustomed to wearing one, seem to accept it and in those horses they remain trim and healthy. The benefit of the exercise they are getting being turned out in very important to controlling insulin levels in all horses. The movement is also important to strengthen the laminae in the foot. How about you? Have you used a grazing muzzle on a horse at pasture? What was your experience? Do you have something to add to Dr. Walsh's tips? 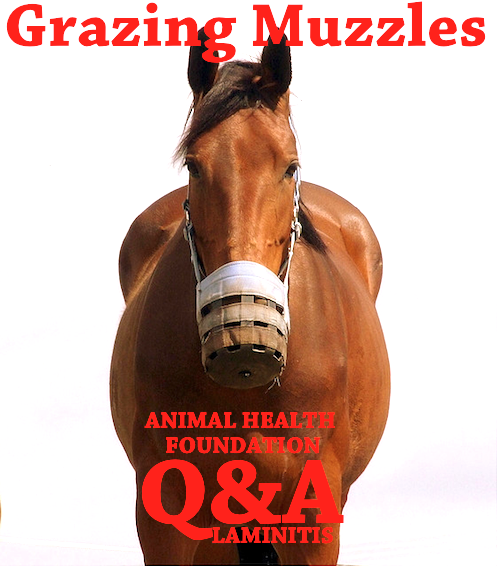 Use the comment box below to add your advice about grazing muzzles. Photo by Judith Whelan--thanks! You can post of a photo of your horse wearing his or her grazing muzzle on the Animal Health Foundation's Facebook page: http://www.facebook.com/laminitisresearch.